After learning about the BPA drama a while back and again recently, John and I have been looking for ways to reduce BPA in our food. It seems like a generally good idea to limit our use of plastic in the kitchen. Don't get me wrong, Plastics Make it Possible, I just don't want to eat it. The glass jar with the cranberries is a regular canning jar, but mom gave me this cool plastic lid that makes reusing the jar super convenient (as long as the food isn't touching the lid, it doesn't leach). The yellow and blue jars also have plastic lids. This was a splurge at an antique store this summer - they are oleo containers from the 50's. Man, I wish my groceries came in cool containers like this. Everything is either disposable or overly branded now. Seriously, Pillsbury (or whoever), I'd buy your flour if it came in a fabric sack. 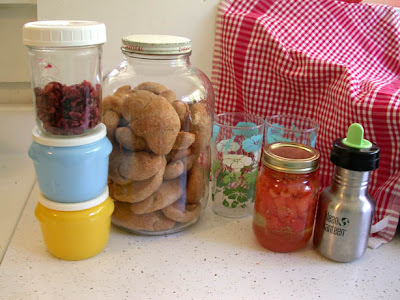 I thought the large glass jar would make a pretty cookie jar (or wheat rolls, whatever). We've been collecting an assortment of vintage glasses with lovely designs. We eat a lot of canned tomatoes (the cans are lined with a substance containing BPA, too), so I canned some myself this summer - although not nearly enough unfortunately. And we picked up a klean kanteen for L.
I really like the Klean Kanteen. Not so uch because of the BPA free thing (really, I don't mind poisoning Jonah) but because it looks way more durable than the plastic ones. Jonah is now drinking from a sippy (or spitting the water all over himself- whatever) and he has a real knack at throwing the sippy down in just such a way that the little piece on the inside that controls the flow will pop out. I love reusing glass jars! They're pretty, and old-fashioned, especially if you do the gingham lid-cover thing (which I don't, but it'd be cute just the same). We buy tomato sauce in a glass jar and those are perfect for holding dried beans; our farmers' market makes jams in regular canning jars, and we've got quite a collection of those now. I was keeping them in hopes of canning produce from my garden, but they've morphed into an extension of our drinking glass collection. Yes, that's right, we drink out of Mason jars. Laura, hi! I just found your great blog because I was checking out your Etsy store to see what was happening and saw the address for this. I'm so glad to have found it. I love the pictures of Louise, she is adorable. I also saw here that you are in the Renaissance Show. Congratulations. I demand you post pictures!